“Last night, I called upon the Knesset factions to join me in as broad a national unity government as possible that would unite the public at a decisive time in our history. The supreme mission that a national unity government will face is stopping Iran from arming itself with nuclear weapons. This is all the more complicated because Iran has equipped itself with new centrifuges that shorten the enrichment time. We cannot countenance this process. Additionally, there are three tasks that we will need to deal with in the first year: The first is to enact a responsible budget and the reforms that will allow us to lower the cost of living. The second task is to significantly increase equality in sharing the burden without causing a rift in the nation. The third mission is to move forward on a responsible and realistic diplomatic process. We need to deal with these three tasks all at the same time and not deal with only one or two of them. Reality and time demands this and it is possible only with a broad national unity government. Our goal is to unite the nation around these tasks and not divide it. Only as broad a union of forces as possible will enable us to meet these tasks and to ensure the future of the State of Israel. Representatives of 82 members of the 19th Knesset recommended to me that I should task the current Prime Minister, Benjamin Netanyahu, with forming the government. President Shimon Peres, this evening (Saturday, 2 February 2013), announced, at an official ceremony, that Member of Knesset and current Prime Minister, Benjamin Netanyahu, will be tasked with forming the next government. Earlier President Peres signed a letter to Benjamin Netanyahu in which he tasks him with the responsibility of forming the government, as demanded by Basic Law: The Government. President Peres said, “I was handed the official results of the elections to the 19th Knesset by the Central Elections Committee Chairman Judge Elyakim Rubinstein, on Wednesday late afternoon. Basic Law: The Government empowers me with the responsibility to task one of the Members of Knesset with the responsibility to form the government, within seven days from receipt of the official results. The country needs the new government at the earliest possible opportunity. And so, immediately after receiving the results I began a round of consultation meetings with representatives of the parties elected to the 19th Knesset, as demanded by the law. The discussions with the representatives of the parties were conducted with full transparency, with professionalism and dignity. I wish to thank all the party representatives who made themselves heard clearly and responsibly. Representatives of 82 members of the 19th Knesset recommended to me that I should task the current Prime Minister, Benjamin Netanyahu, with forming the government. I considered the matter and decided to task Benjamin Netanyahu with the formation of the government, after I received his agreement, as stipulated by law. The representatives of the different parties raised important issues with me during our discussions and asked that they be considered when the government is formed. Included amongst them: the national deficit, social justice, the fight against discrimination, equitable sharing of the national burden, conscription to the IDF, restarting diplomatic negotiations to achieve peace and ways to deal with the security threats facing Israel. I will pass these issues on to the Prime Minister. Prime Minister Netanyahu said, “Thank you, President Peres. Dear citizens of Israel, I wish you all a good week. I thank you for the trust you have placed in me. It is an honor and a major responsibility to receive the mandate from you, for what is now third time, to lead our country. We have many internal issues to deal with. But firstly, in the Middle East, we must ensure our security. The primary mission of the next government is to stop Iran from becoming armed with nuclear weapons. We will also have to deal with other lethal weapons which are building up in our area and with threats against our cities and our citizens. We must continue to strengthen the Israeli economy. The next government which I will form will be committed to peace. I call upon Abu Mazen to return to the negotiating table. I am committed to dramatically increase the equitable sharing of the national burden. I am sure we can do this in a responsible manner, which will bring about a fundamental change without tearing apart. Tasks of this nature demand a national unity government, as wide and stable as possible. The reality in which we live has no place for boycotts. President Obama congratulated Israeli Prime Minister Benjamin Netanyahu on winning the most seats in the next Knesset and said he looked forward to working with the new government. Prime Minister was quick to call other potential coalition partners, but extra-slow to call Bayit Yehudi head Bennett. Prime Minister Binyamin Netanyahu has phoned Bayit Yehudi chairman Naftali Bennett and spoken to him. The two exchanged congratulations on their respective achievements in the elections. “A heavy responsibility was placed our shoulders,” says Yesh Atid chairman after exit polls predict he’ll lead the second largest party. 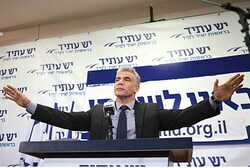 “A heavy responsibility was placed our shoulders tonight and the State of Israel is facing serious challenges,” Lapid said in a victory speech at his party’s headquarters. 66.6% of eligible Israeli voters exercised their right to vote in the 2013 elections, according to final numbers. 66.6% of eligible Israeli voters exercised their right to vote in the 2013 elections, according to final statistics presented on Tuesday night. אני מבקש להודות למיליוני אזרחי ישראל שמימשו היום את זכותם הדמוקרטית. על פי תוצאות המדגמים ברור שאזרחי ישראל קבעו שהם רוצים שאמשיך לכהן בתפקיד ראש ממשלת ישראל, ושארכיב ממשלה רחבה כלל האפשר. התוצאות המסתמנות הן הזדמנות גדולה לשינויים רבים לטובת כלל אזרחי ישראל. מערכת הבחירות מאחורינו ואתגרים רבים ומורכבים לפנינו. כבר הערב אתחיל במאמצים להרכבת הממשלה הרחבה ביותר שניתן.